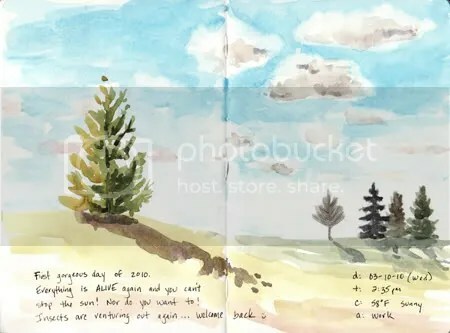 Gorgeous Day Sketch – Let's Paint Nature! The grasp of Winter’s hold had slipped as Spring crushed its dominion, breaking through and reaching out…infecting us all. A dramatic sentence, huh? Well dramatic best describes a day like today. Life returned. All of the snow has melted. The temperature soared to 58°F and the sun was unstoppable! Insects awoke from a torpor state and were active seeking adventures in a new year. I welcomed them back. During a break from work, I had to do a quick 30 minute sketch of this beautiful event. It is the first gorgeous day of 2010. How energizing it was! Hoo-effin’-ray for Spring, is all I gotta say. Hoo-effin’-ray! We were away when the warm, sunny weather was last week. But, I’m looking forward to better days this weekend. I like your sketch–it expresses the feelings I have on a nice spring day. Lana: HAHAAAAA, HA! I love your hoo-effin’-ray! Joan: Thanks, many more warm days to come…I hope! Bummer you missed the nice weather though!